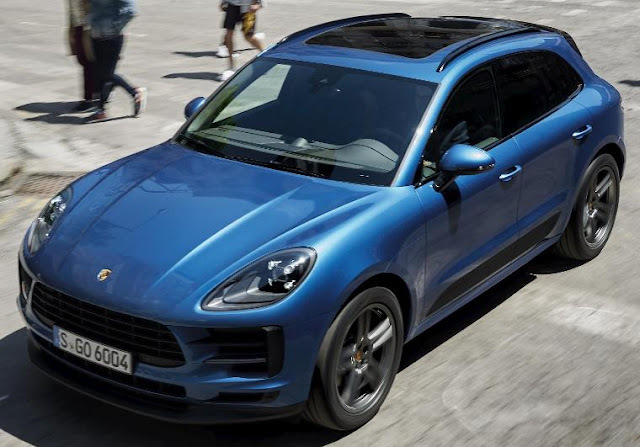 The 2019 Porsche Macan is powered by a 248 horsepower 2.0-liter, four-cylinder turbocharged gasoline engine with a seven-gear PDK dual-clutch transmission for a 0 to 60 mph time of 6.3 seconds, or 6.1 seconds with Launch Control if equipped with the optional Sport Chrono package, which migrates to an updated design for this model year. The new model can accelerate to a top track speed of 142 mph. New features for 2019 include a new three-dimensional LED light panel at the rear, standard LED headlights, and a revamped interior design, including a larger, 10.9-inch full HD touch screen with the latest version of Porsche Communication Management. Porsche Dynamic Light System Plus (PDLS Plus) is still available as an option, offering improved lighting while cornering. The 2019 Macan also gains the new Traffic Jam Assist function as a component of the optional adaptive cruise control system. When so equipped, the Macan can accelerate, brake, and keep itself within a marked lane at speeds up to 40 mph. The new Macan is expected at U.S. dealers by Summer 2019 with a starting MSRP of $50,950 (including $1,050 for delivery, handling and processing). 2020 Range Rover Evoque Debuts In U.K.